After a night of a lot of rain and some serious thunderstorm action, we awoke to a nice, sunny, and almost smokeless morning on our third day. There’s something quite nice about waking up at a campsite and not having to pack your gear up to move along to the next camp. Since we were now settled for three days, we had a different hike planned for each day, starting with the Windy Ridge Hike. As we figured this hike would take half a day or so, we got an early start to beat both the heat and the crowds. We also found that there was usually less smoke early in the day as compared to the afternoons, which made for better photos of the surrounding peaks. From the lodge, one heads north towards Og Mountain, which stands above Windy Ridge. 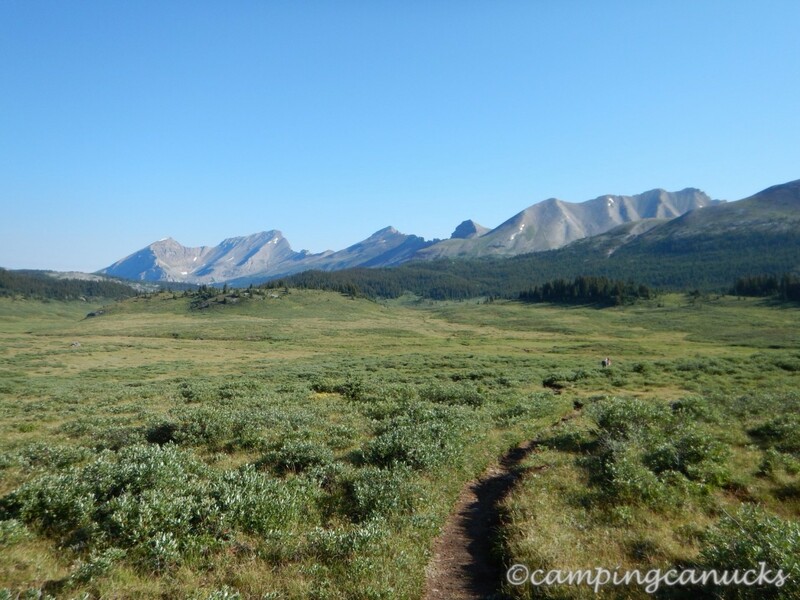 The first few kilometers are a nice stroll through some of the scenic meadows that are a characteristic of the subalpine forests found at the higher elevations. Being that it was early August, the flowers were fully in bloom and there was an abundance of colours to be seen. Along the way, we also passed a horse group on their way in. I have to admit that sometimes it seems like a good idea to have a pack horse along to carry your gear. 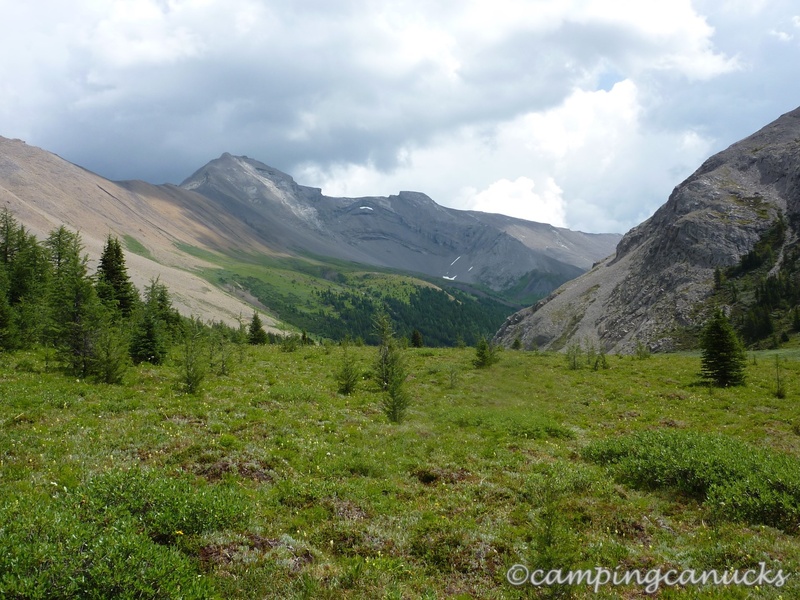 After crossing the meadows, we found ourselves back in the forest for the climb towards Og Pass. This was a good thing as it was starting to get warmer out and the shade made for a nice break from the sun. The grass was alive with flowers and colour and ground squirrels chirped and ran around all over the place. As Kirk put it, the area was infested by squirrels. Once clear of the trees, we crossed the top of Og Pass, which itself heads in a south easterly direction towards Allenby Pass. From here, the going got a bit tougher as we entered the steepest part of the hike to Windy Ridge and we were once again heading up a series of switchbacks. But at least here, we were now above the trees and each switchback brought us a higher and more stunning view. 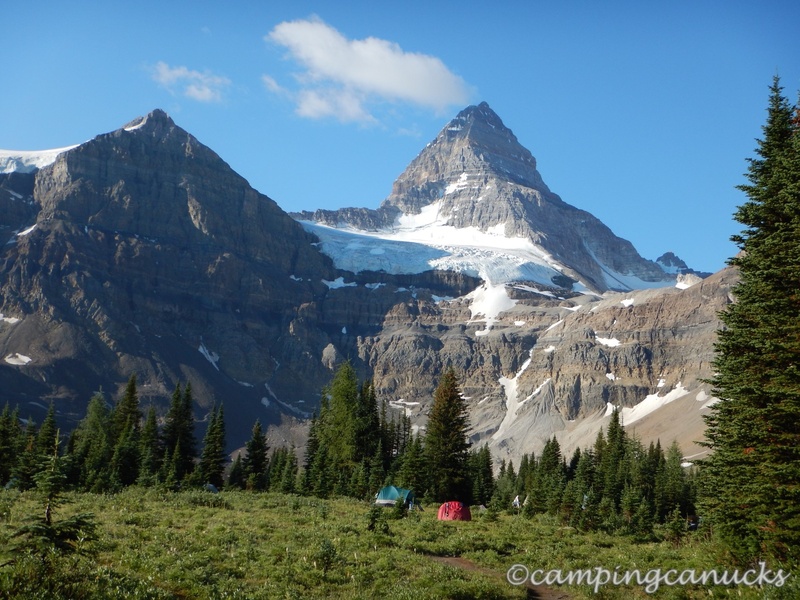 Smoke notwithstanding, Mount Assiniboine projected its presence on the entire valley below. Before too long, we decided to stop for a break and a quick snack before pressing onto Windy Ridge itself. The last part of the hike was now well above the treeline and we continued up on the loose rock trail, which at times was quite slippery. We were fully exposed to the sun at this point but with the wind blowing quite strongly, it kept us nicely cooled off as we made our way up. 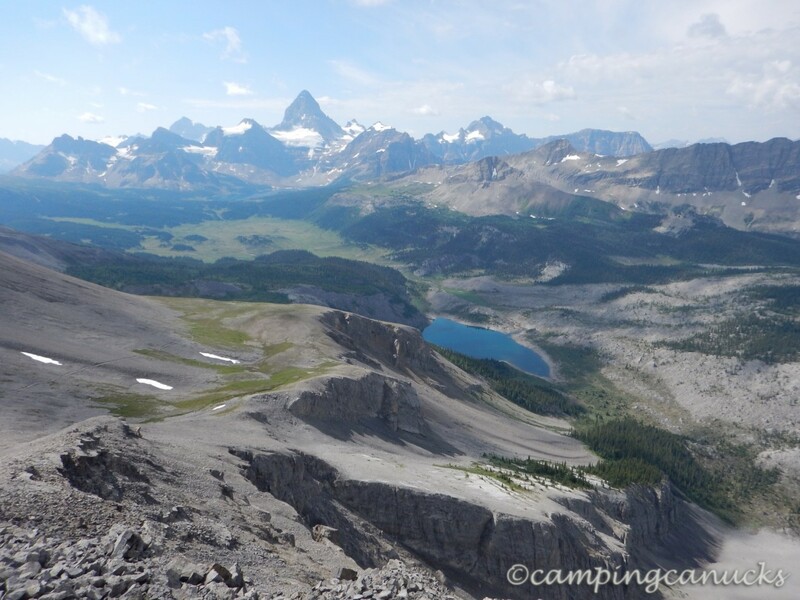 The top of Windy Pass brought us some outstanding views of the eastern peaks that are not visible from the Assiniboine Valley itself. 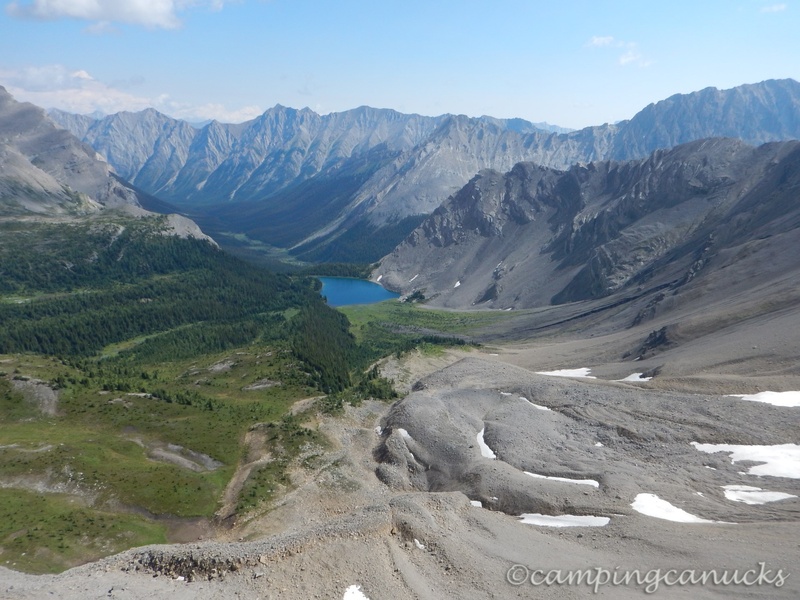 Nestled down in the valley below we could also see a small lake and a backcountry lodge. From here, one can also scramble to the top of Og Mountain for a 360 degree view of the area. 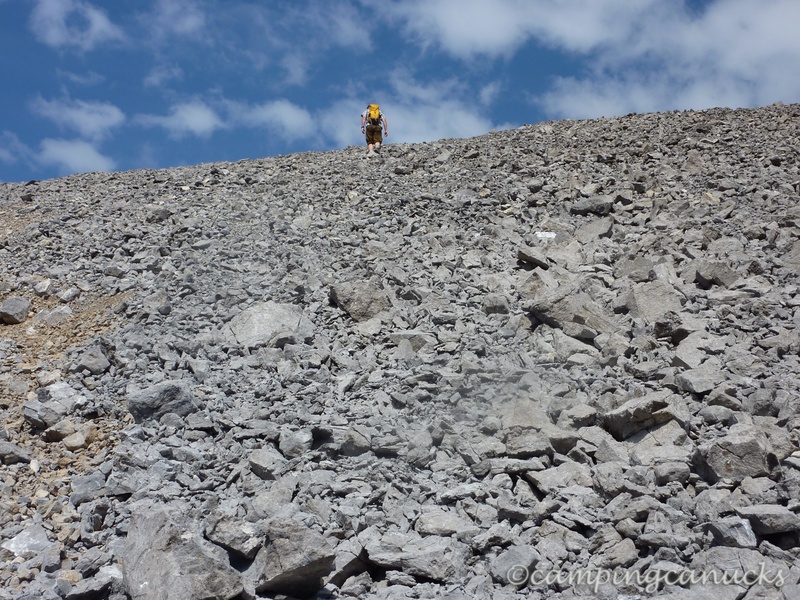 The scramble was not really difficult but with all the loose rock, one has to be quite careful not to slip and fall. Near the top, the path was only about two feet wide in sections and drops hundreds of feet on both sides. I wouldn’t recommend going up this trail unless you are comfortable with such conditions. Even coming down was a bit tricky and there was a point where I started a rock slide and just had to sit for a few moments and wait for the rocks to stop. That said, it was worth it for the views. We again enjoyed a little break to just savour the views, using the convenient windbreak to keep from getting too chilled. It may have been the middle of summer but Windy Ridge was living up to its name and one cooled off quite quickly once idle. We hung about for a bit before making our way down. On the way down, we started to meet up with the later morning crowds on their way up. We noted again how it’s worth it to get an early start to a day and be able to enjoy hikes like this by yourself without all the noise and congestion of crowds. Making our way back was a straightforward affair. 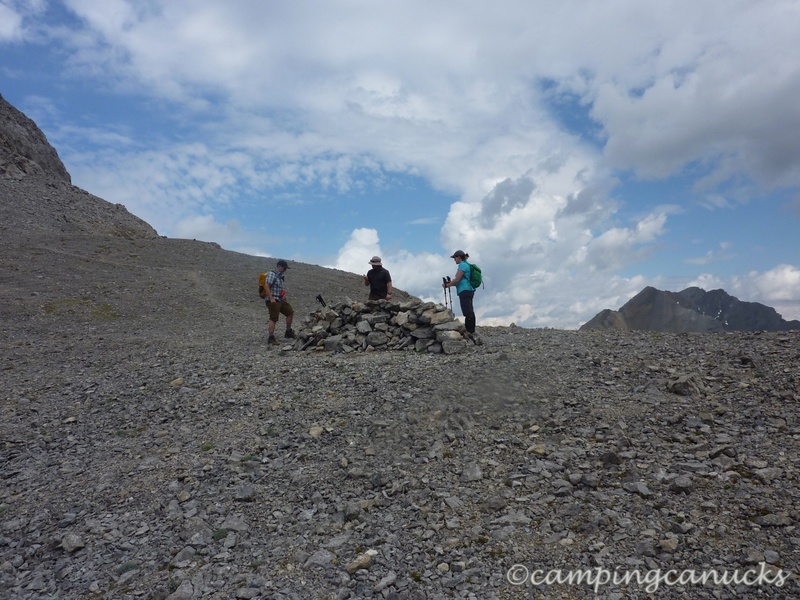 We had hoped to timed our return to make it for Assiniboine Lodge’s ‘Tea Time’ but found that we had a couple of hours to burn so we went back to camp and read for a bit. 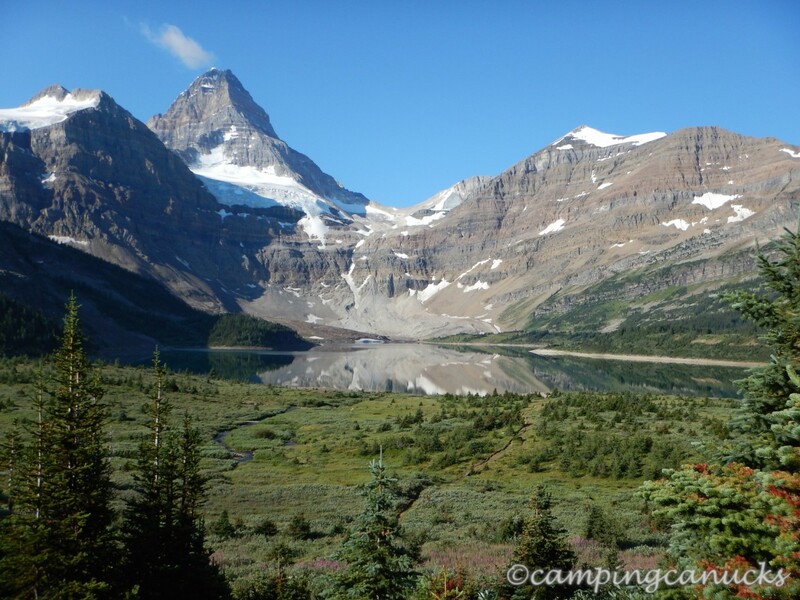 Tea time at Assiniboine Lodge is a real backcountry perk where the tired hiker can stop in, be served tea, cake, beer and wine and just sit back for a bit and gaze over Magog Lake at Mount Assiniboine. The alcohol, however, went straight to our heads, and for me at least, made an interesting walk back to our camp 2km from the lodge. 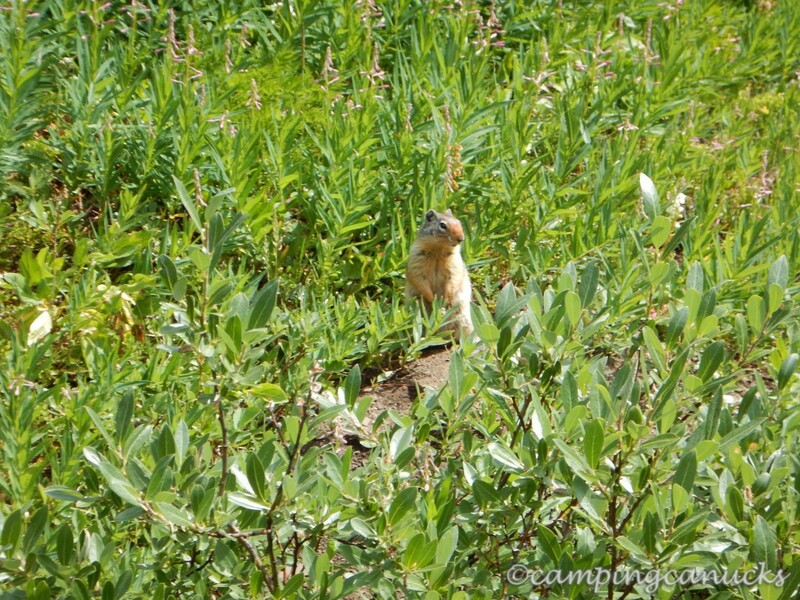 We found this second night at the camp was a far quieter experience than it had been the night before. Being the end of a long weekend, a large number of the campers had packed up and headed on their various courses somewhere along the trails. 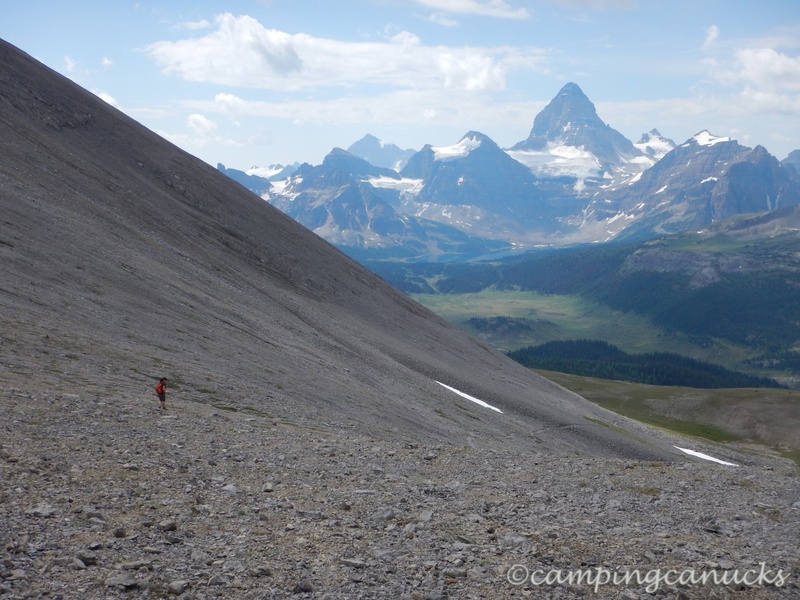 As was usual, we enjoyed another of our great homemade dinners and relaxed and played cards for the rest of the evening as we rested up for the most difficult hike of our time at Assiniboine: the Nub Peak hike.